You must have been tired from roaming the Isles, touring the halls of SMX, browsing through the many, many, many bookshelves. You must have been sufficiently intoxicated (as I was) by the smell of books and decided it was enough. Or, you probably simply couldn’t wait to read your new books. I just had to smile when I saw you, eyes focused on nothing else but the spot on the floor next to me where you immediately sat and opened the book I knew you were dying to read. At that moment I felt a kinship towards you. Although we didn’t say anything, even though we barely even looked at each other, I smiled at the thought of sharing space with someone who had the same ability to dive into a sea, into the depths of ideas books provide us. It is one of the rare kinds of silence I love and am comfortable with – the silence shared between people reading. 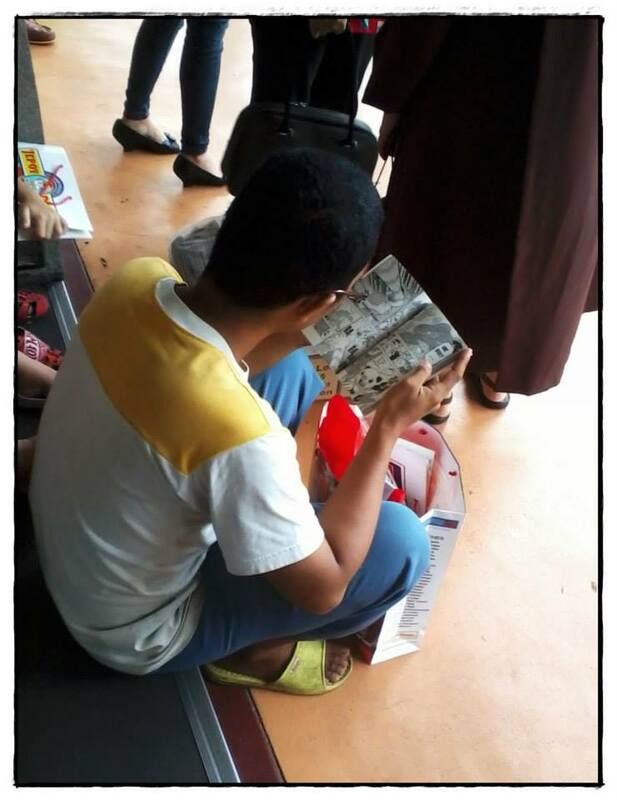 Random guy reading his manga. That’s a Cosplayer in front of him. 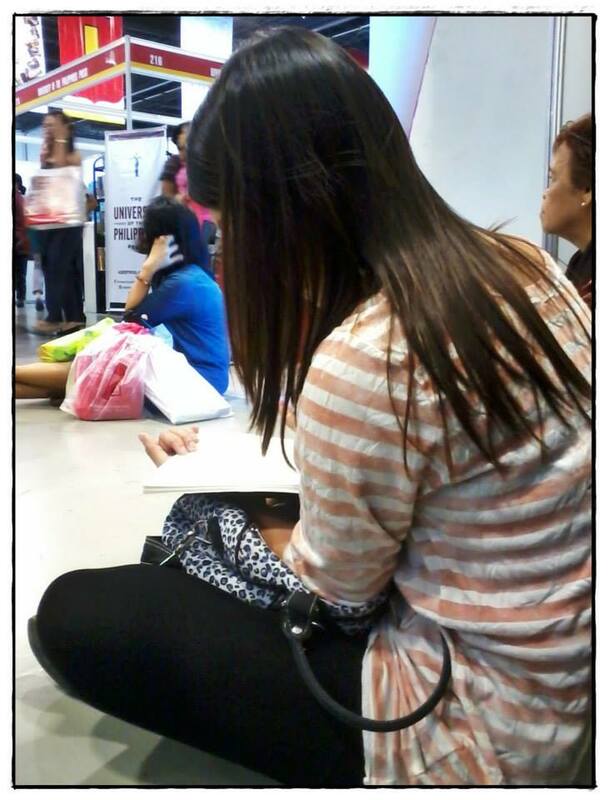 You were sitting at the stairs, at the entrance of SMX. People dressed up as anime characters were right in front of you (they seem to be doing Cosplay events simultaneously with book fairs at SM). Those cosplaying kids were really an eye-chatching bunch. How could they not be, with their bright wigs, thick make-up and multi-colored costumes? I found it a really interesting picture: there you were, reading Manga in front of people dressed up like the characters you were reading about! But at that moment I felt an affinity with you. Affinity, and respect for you. For someone like you who preferred re-creating and re-imagining characters and scenes in his mind rather than be distracted by material, real, flesh-and-blood eye-catching characters. I will always have an affinity and respect for people who can use their imaginations. 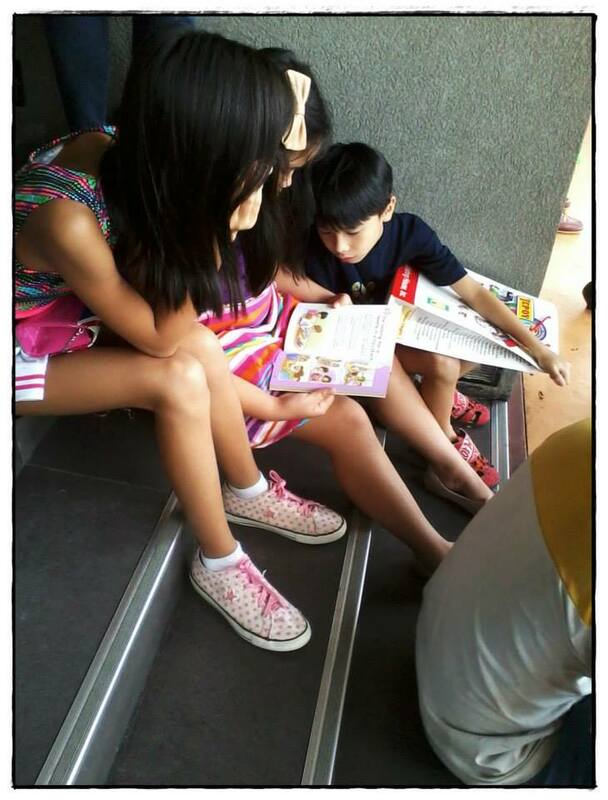 Random kids reading their storybooks. You just brought me back to my childhood, seeing you so engrossed with your new storybooks. That you would keep reading, and find that there are vast worlds yet to be discovered, millions of thoughts to chew on, even more oceans of ideas to dive into, stories of people of the present and from ages past… and they are all available to you, young reader. 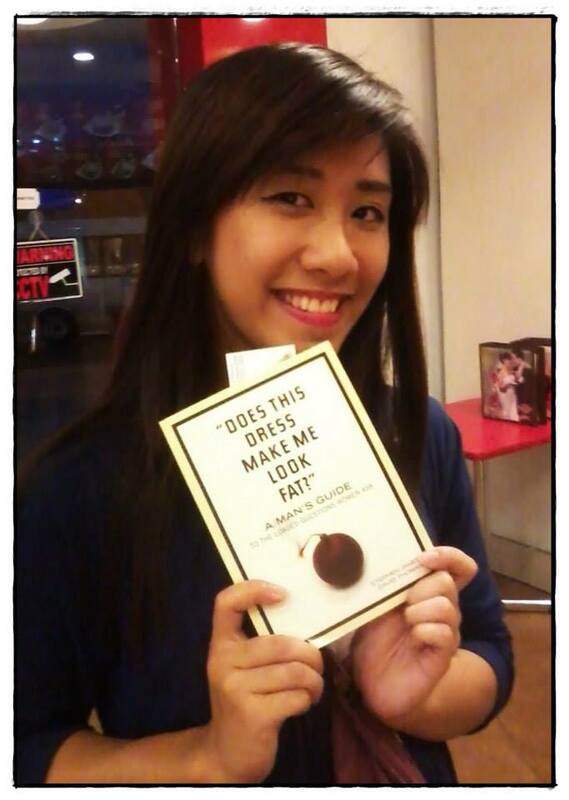 I can’t write about the Manila International Book Fair (MIBF) and not give a shout out to my favorite bookstores. My default stops during MIBF are OMF Lit, CSM, CGM and Navigators. OMF Lit left us drooling with their sale bundles and cheap books! I just learned that OMF Lit is trying to make Christian literature more accessible to the masses by lowering the prices and publishing more Taglish (Tagalog-English) books. I totally respect the heart behind that. CSM surprised me too – a lot of titles with very cheap prices (one hundred peso books!). A lot of their titles were the kind you could give to friends as well (a very good deal, if I might say so). Navigators is always a great resource for discipleship books. Not surprisingly, Edmund Chan’s books were featured at this year’s book fair. And there’s CGM, with their tiny but book-filled stall. I go to CGM for heavier stuff written by old (as in, old) authors, some of them dead. In other words, classics. “Does this Dress Make Me Look Fat?” by Stephen James and David Thomas. Very fun read.